Victory Fighting Championship has set its main card lineup for the highly anticipated year-ending event set for Saturday, December 16th live on UFC FIGHT PASS®. 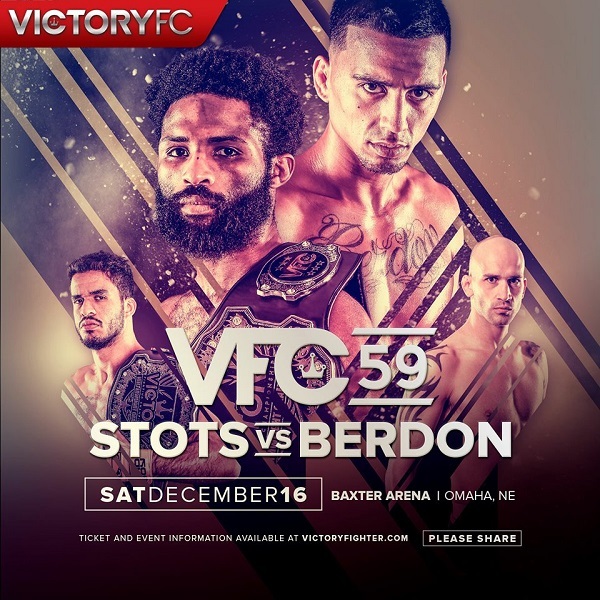 Established VFC talent as well as exciting new prospects are all part of the VFC 59: Stots vs. Berdon roster, headlined by the showdown for the VFC bantamweight title with Raufeon “Supa” Stots defending his belt against Hawaiian sensation Arnold Berdon. The co-main event will also see title fight action as reigning VFC welterweight champ Yuri Villefort puts his belt on the line against challenger Victor “Superman” Moreno. These previously announced bouts have now been teamed with the rest of the main card which will air on UFC FIGHT PASS® from Baxter Arena in Omaha, Nebraska, beginning at at 10 p.m. ET / 9 p.m. CT / 7 p.m. PT. 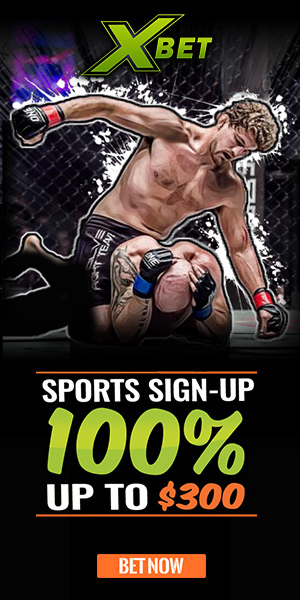 Martinez has won three of his last four, including his 15th appearance in the famed VFC square cage back in July when he submitted Mike Plazola with a first-round rear-naked choke. The 33-year-old from Papillion, Nebraska, has fought some notable names of the course of his lengthy career, highlighted by a first-round submission victory over current UFC talent Abel Trujillo. Along the way, “Zo Diddy” has also faced the likes of fan favorites Clay Guida and Yves Edwards, and picked up his most significant VFC win over Ryan Roberts. In the midst of making his VFC debut, Moret, who hails from Mankato, Minnesota, has won five of his last six outings. He also earned a submission win over Plazola, taking him out in round two of their encounter. The 31-year-old “Hitman” began his career with an impressive six-fight winning streak. One of the hottest fighters on the card, Logan will ride a four-fight winning streak into VFC 59. The surging 27-year-old South Dakota product scored a decision win over Cody Carrillo at VFC 58 back in July, and last December at VFC 54, he earned his best win to date as he starched Robert Ostovich with a first-round knockout. The upcoming bout will be Pfeifer’s eighth appearance as pro in the VFC square cage. He also fought seven times as an amateur under the VFC banner. The 31-year-old from Kansas has won three of his last four including a decision verdict over Carrillo at VFC 57 in May. Four of Pfeifer’s six career wins have come inside the opening round. 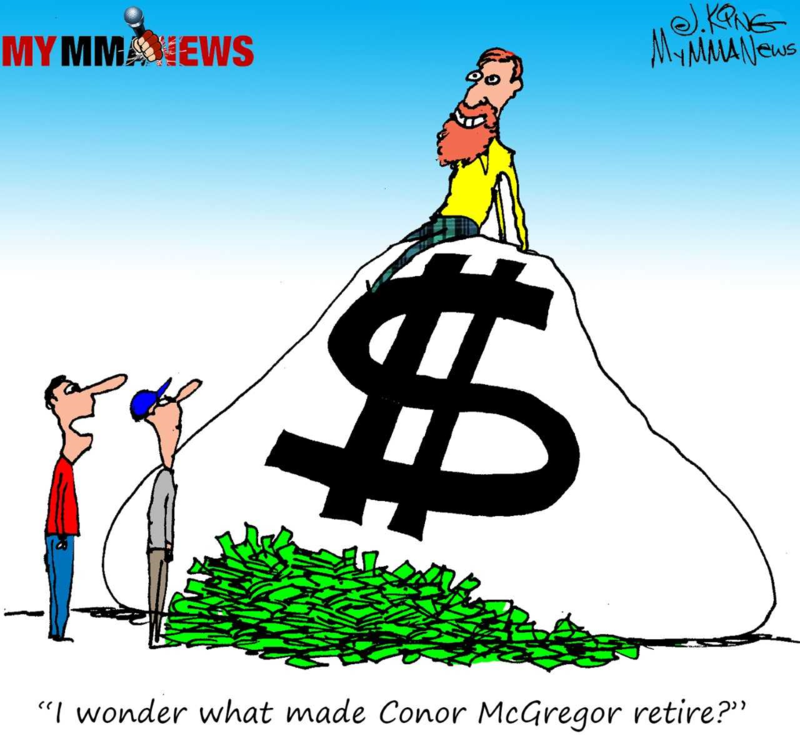 Firefighter/MMA fighter Nawrocki is certainly on a roll. The 25-year-old won the VFC amateur title with a 49-second submission at Fight Night Harrah’s 2 then handily defended it via a second-round knockout at VFC 47. The Bellevue, Nebraska, native then turned pro at Fight Night Harrah’s 4 where he earned a second-round submission victory. In his latest outing, Nawrocki registered a decision win over Jaime Medina at VFC 58 back in July. Robinson made his pro debut at VFC Fight Night Harrah’s 5 this past June and the 28-year-old Nebraskan scored a TKO win over Ryan Beckett coming with one second remaining in the second round. The much-anticipated debut for the unbeaten Vanderford arrives. Originally from Ninilchik, Alaska, and now fighting out of Portland, Oregon, Vanderford made his professional debut back in March and scored a first-round TKO victory. He followed that up with a pair of decision victories, including his most-notable win to date coming with a verdict over Ben “Phoenix Jones” Fodor. Now 27, the former two-time All-American and NAIA national champion wrestler out of Southern Oregon University expects to be cornered by his girlfriend, UFC flyweight sensation and Dancing with the Stars finalist Paige Van Zant, along with UFC veteran and The Ultimate Fighter finalist Ed “Short Fuse” Herman. Licea has had a rough 2017 with three consecutive losses, but the 30-year-old from Kansas opened his career with three wins in four fights, all three victories coming via first-round finish. 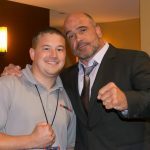 His last victory came almost exactly one year ago when he registered a submission verdict over Gary Westphal at VFC 55. Omaha’s own Buss has won three in a row, picking up his latest success at VFC Fight Night Coco Key with a second-round tapout over Jeremiah Deever. 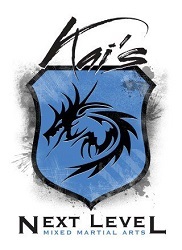 The 23-year-old also registered a submission win at Fight Night Harrah’s 5. Buss ran roughshod over his opposition in the VFC amateur ranks, going 10-0 with nine finishes – six of them coming in the first round. He made his pro debut at VFC 46 and picked up a second-round TKO over Timehin Babalola. After an 8-0 run through the amateur ranks, Whitehead lost his pro debut but has since rebounded with back-to-back victories, both coming by way of TKO including one inside the opening round. The 21-year-old from Fort Dodge, Iowa, returns to the 170-pound division after previous action at both 185 and 205.